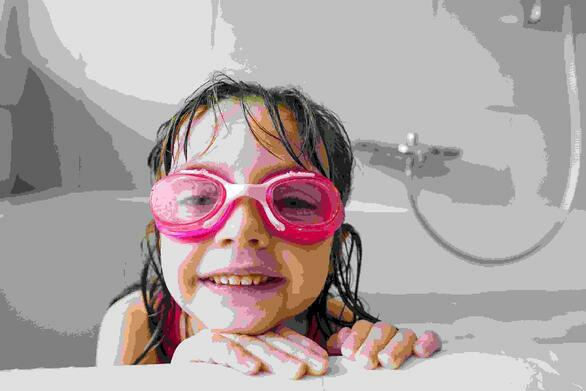 Wearing goggles: Goggles can be worn in the bathtub, and even around the house to get young swimmers comfortable while wearing them. Back floats: Working on back floats at home is done in the bathtub or pool, with the child lying on their back, and ears fully submerged. This technique is great for baby swimmers! Breath holding: Children can practice holding their breath underwater in the bathtub working in increments of three, five and ten seconds. Humming/Blowing bubbles: When students hum, air is released from their nose. When they are underwater this will cause them to blow bubbles. In the bathtub, students should use this technique to achieve slow controlled humming underwater. Straight leg kicking: It’s possible for children to practice kicking on their stomach or back while lying on their bed. This forces a straight leg. Straight leg kicks are important in swimming because it helps them stay afloat. Reaching arms and scoops: Reaching arms can be done while watching television or grabbing for something, which helps fine-tune essential arm skills. Scoops can be practiced while walking around the house to help children get a good feel for what it’s like to scoop deep through the water with their “peanut-butter fingers” closed tightly together. Children build confidence in the water by practicing and further developing the skills they learned during swim lessons both in and out of the pool. Swimming is a skill, and it’s important to remember that just like any other skill (reading, math, etc.) children will excel when they have the opportunity to practice and improve what they learn.